This is the ninth in a series of blog posts about recovering from the Gulf oil spill and from oil dependency overall. The first introduces the series. Yesterday I wrote about cleaning up our energy act -- the need for which is now made even more apparent by the Gulf oil disaster -- and of the importance of taking personal action to do so. If you’re looking for a simple way to get started, here’s a technique I like very much. It’s called the Circle Game, and it was created by Ellen Santasiero of Bend, Oregon. Find your neighborhood on the map. Place the point of a divider compass on the approximate location of your home. 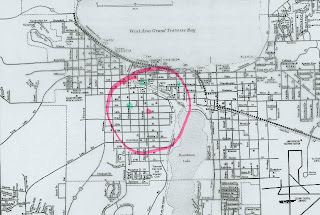 Using the compass or a colored pen as shown above, draw a circle with a two-mile radius on the map. Find places that you regularly visit and circle them or mark them with a highlighter. Include your workplace, bank, grocery store, library, schools, church, and other places you visit often. Choose one of the places that falls within the circle and commit to walking, biking, or taking transit to it instead of driving every time you go. Every week or so, commit to walking, biking, or taking transit to another location from within the circle. Continue adding locations until you routinely use alternatives to driving for getting to every location within a two-mile radius of your home or workplace. You can go on to do this with places outside the two-mile radius, or you can replace those more distant businesses or services with alternatives closer to home. Try experimenting with expanding your circle, too, or using concentric circles to determine comfortable walking and biking distances for you. 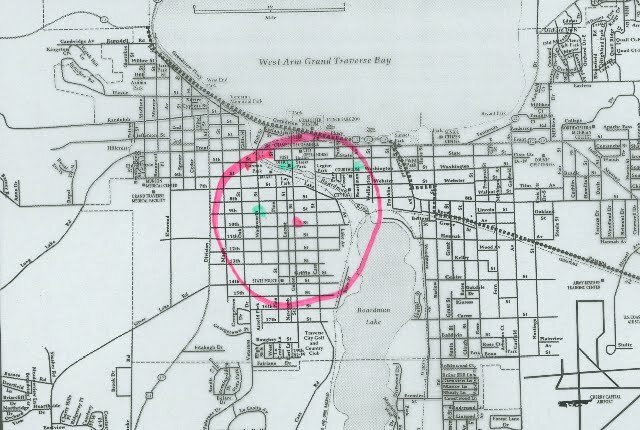 For example, if you decide to walk to all places within a mile, and bike to places within four miles, draw circles with those radii on your map and identify all the walkable and bikable destinations within them. This technique can also be used when you move to aid in finding a new location based on proximity to services, work and school. Likewise, it can be used when looking for work to locate job sites closest to your home. 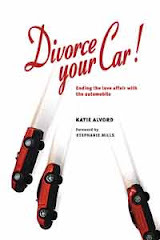 I frequently mentioned the Circle Game when on book tours for Divorce Your Car! and at one point it was even featured in a spot on Canadian TV. Many thanks again to Ellen Santasiero for coming up with this technique!